The haulage industry is arguably the most competitive business to be involved as margins between success and failure are a very fine line. There are so many issues to deal with on a daily basis that anyone outside and never involved in the industry would beg to ask the question why bother? Most will tell you that it is in the blood as generally there are generations of families working in the industry, however, there are a few that are just drawn to the industry and have a genuine love of trucks. One such person is Fergal Mullan who despite having a background in the construction industry, established ALF Haulage Ltd in 2015 and hasn’t looked back since. Based in Coleraine, Co Derry, the company has gone from strength to strength in the last few years as they provide an excellent service in next day delivery in Ireland and the U.K.
“I always had an interest in trucks and as the building trade was not what it used to be I decided to diversify into the haulage industry and thankfully it has worked out so far,” said Fergal. There are many different sectors within the haulage industry, but all have a common goal; delivering products on time. Efficiency is one of the greatest assets to obtain when running a successful haulage company. There are so many daily issues to contend with that everything has to run smoothly. Specialising in curtainsider and flat transport haulage, the company has developed a reputation for providing a reliable and efficient service to their loyal customers many of who have a strong business relationship with the ALF team. 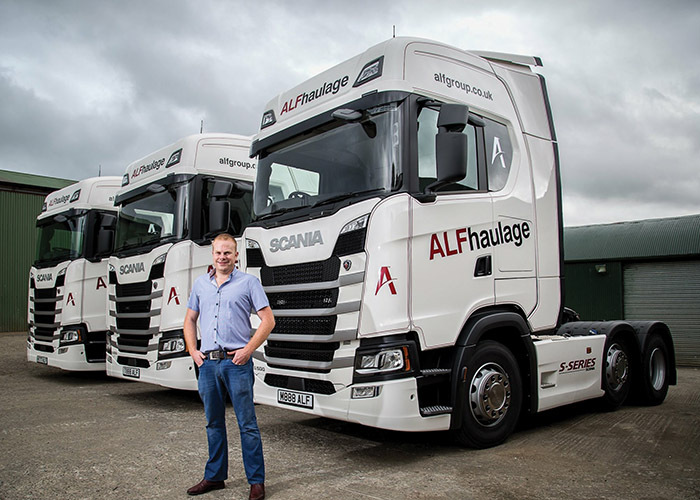 Fergal stressed that there are many overheads to contend with in the haulage industry, but added that a good customer base can ease the strain somewhat. “There are huge overheads in the industry from insurance, fuel, tax, wages and shipping, this all adds up and you have to pay all these bills before you start making a profit. Of course, one issue that is effecting all businesses that operate both north and south of the border is Brexit and like most people Fergal is uncertain of how the process will take effect on the likes of his business. To run the business so proficiently, Fergal operates a modern fleet of trucks and trailers that are kept in pristine condition. “We have 13 trucks, most of them are Volvo, but we would have three Scania as well as a DAF and a Renault. Maintenance is a key aspect of the business as it is essential to have a reliable fleet on the road and Fergal revealed that they place a huge emphasis on looking after their fleet. Fergal is pleased with the direction that the business has taken in the last few years and he acknowledges the fact that it is essential to continue improve on the service, in order to maintain excellent customer service. “We are there for the customer and anything they need done, we will do it to the best of our abilities. We have always prided ourselves on getting the job done on time. When you are working with crane offloading and next-day freight there are time constraints in place and you MUST meet those times.